So you're thinking about a holiday to Waimea? If you want a place to call home that's located near some well-known Waimea attractions such as Waimea Canyon, just go to Orbitz, choose your travel dates, and voilà! Review the list of hotels and other accommodations to find those that are close to what you want to see while you're visiting. You may not find the ideal accommodation in the heart of Waimea, but you can pick from 2027 accommodations within the larger area. Search by filters such as price, neighborhood, guest rating, or popular locations, depending on what's most important to you. We make it easy to find a convenient flight into Lihue, HI (LIH), which is 17.6 mi (28.4 km) from the heart of the city. Find your ideal flight in nothing flat by using the filters on our site to narrow down your search. 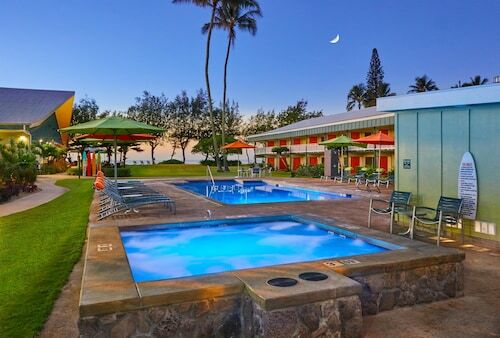 There may be just a few hotels and accommodations to choose from in Waimea, but here some other options located close by so you'll have some choices. What's the Weather Like in Waimea? What a welcoming staff. Every interaction we had was very pleasant. Very clean, comfortable beds and clean rooms. The setting at Lava Lava Beach Club was right on the beach and we had the opportunity to dine there for breakfast and dinner. The food was fantastic. I would highly recommend a stay here. We loved this hotel. We were deciding between Kauai Shores, Coral Reef and Hilton. This one was by far the best. It's beautiful inside and out. Clean rooms, great staff, and love that they are so close to the beach. We would stay here again if we get another opportunity to go to Kauai.